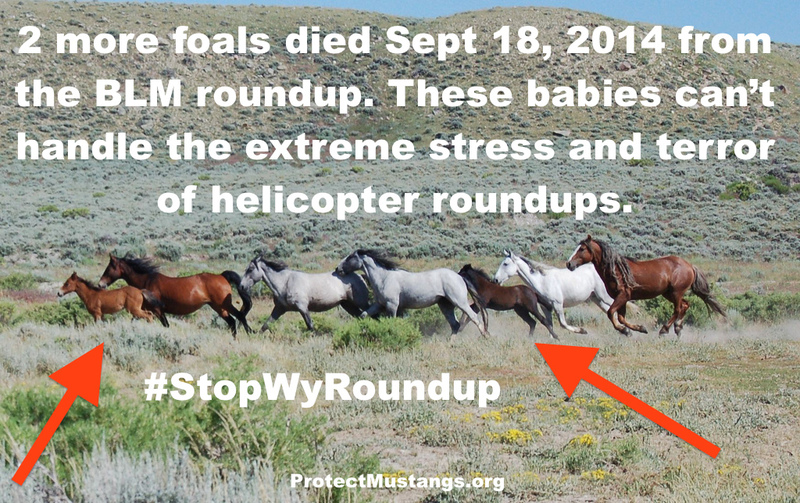 The stress and terror of the BLM’s cruel helicopter roundup is taking it’s toll on very young wild horses. Take action against this atrocity and contact your elected officials to request an immediate moratorium to all roundups. These deaths are a red flag. Now 3 native wild horses have died. Get active before more wild horses die in BLM’s roundup. One helicopter gathered 23 mares, 29 studs and 12 colts at the Black Rock Trap in the Divide Basin Herd Management Area. Cause: A three-and-a-half month old black filly was found dead in a short-term holding pen. A necropsy was performed but the cause of death is undetermined. Cause: A six-month-old brown colt collapsed in a horse trailer. The necropsy revealed that the colt had scar tissue and nodules on its lungs, indicating that it likely had pneumonia previously. Tissue has been sent for testing with results expected in several weeks. This entry was posted in Uncategorized and tagged BLM, deaths, foal, roundup, Wyoming by Protect Mustangs. Bookmark the permalink.